By using a drug to stimulate resident cells to become new hair cells, scientists from the Massachusetts Eye and Ear Infirmary and Harvard Medical School have shown for the first time that hair cells can be regenerated in an adult mammalian ear, resulting in the partial recovery of hearing in mouse ears damaged by noise trauma. Boston (Jan. 9, 2013) – Hearing loss is a significant public health problem affecting almost 50 million people in the United States alone. Sensorineural hearing loss is the most common form and is caused by the loss of sensory hair cells in the cochlea. Hair cell loss results from a variety of factors including noise exposure, aging, toxins, infections, and certain antibiotics and anti-cancer drugs. Although hearing aids and cochlear implants can ameliorate the symptoms somewhat, there are no known treatments to restore hearing, because auditory hair cells in mammals, unlike those in birds or fish, do not regenerate once lost. Auditory hair cell replacement holds great promise as a treatment that could restore hearing after loss of hair cells. In the experiment, the researchers applied a drug to the cochlea of deaf mice. The drug had been selected for its ability to generate hair cells when added to stem cells isolated from the ear. It acted by inhibiting an enzyme called gamma-secretase that activates a number of cellular pathways. The drug applied to the cochlea inhibited a signal generated by a protein called Notch on the surface of cells that surround hair cells. 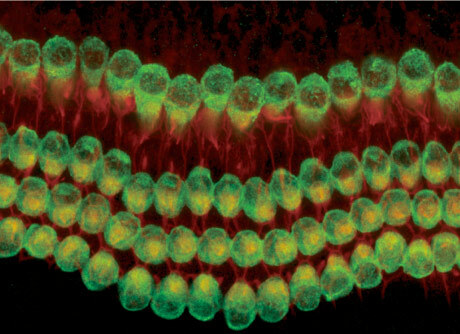 These supporting cells turned into new hair cells upon treatment with the drug. Replacing hair cells improved hearing in the mice, and the improved hearing could be traced to the areas in which supporting cells had become new hair cells. “The missing hair cells had been replaced by new hair cells after the drug treatment, and analysis of their location allowed us to correlate the improvement in hearing to the areas where the hair cells were replaced,” Dr. Edge said. Funding sources: This work was supported by grants RO1 DC007174, R21 DC010440 and P30 DC05209 from the National Institute on Deafness and other Communication Disorders (NIDCD); by the Tillotson Corporation, the Shulsky Foundation, and Robert Boucai; by the Mochida Memorial Foundation for Medical and Pharmaceutical Research; and by Grants for International Activities in Life Sciences and Medicine, Keio University Medical Science Fund. Be the first to comment on "Researchers Restore Hearing to Noise-Damaged Ears"